Adventure Vacation in Galapagos: Seize this Opportunity! “Twenty years from now you will be more disappointed by the things you didn’t do than by the ones you did do. So throw off the bowlines. Sail away from the harbor. Catch the trade winds in your sails. If you had the opportunity to go back to a land before time, untouched by man and civilization, would you go? Would it entice you even more to know that said land is crawling and populated by some of the most fantastic, still-existent creatures that our Earth has ever seen? An adventure vacation in Galapagos is a connection with nature and this planet that is unlike anything many have ever experienced, let alone dreamed of. What’s more? An adventure vacation is something that can seriously change the way you see the world and create memories that seem like they’re plucked straight out of a fantasy book. So, are you looking to reignite your concept of adventure by plotting a course to an entirely different world? Metropolitan Touring invites you to do just that, and hop aboard our Galapagos options with the best-in-class activities for engaging and experiencing this extraordinary adventure vacation in Galapagos. The Galapagos: Where you discover that your body is an organic spacesuit that allows you to experience a new place and new things like never before. What does an Adventure Vacation in Galapagos consist of? Travelers often see the Galapagos as a sort of passive experience (granted, the islands are a living laboratory of evolution that should be observed at a proper and safe distance), but this isn’t the whole story. From active volcanoes to otherworldly terrain and landscapes that are dotted by clusters of fascinating creatures that also look like they’ve been plucked from an alien world, the Galapagos Islands are like a treasure chest of novelties that rests at our fingertips. Should we delight ourselves in opening the lid of said chest, we not only get to passively examine the islands – we get to throw ourselves into them, and experience a world that’s unlike anything we’ve ever seen before. Travelers nowadays are constantly on the move and in pursuit of something that will ignite their senses like never before. In a word, a true adventure vacation needs to be at least one thing, and that is: FRESH. That’s why an adventure vacation in Galapagos is a novel and spectacular must – virtually everything is unique, and the level of endemism and unbelievable fearlessness of the creatures makes Galapagos a truly exclusive, one-of-a-kind vacation. It’s why UNESCO made it a World Heritage Site! It’s also why we have our handy BIG15 list of iconic Galapagos animals! A diverse selection of activities is the fundamental component of any proper adventure vacation, especially in Galapagos. Follow along as we go through the numerous Galapagos activities that we offer individual guests and for the whole family! 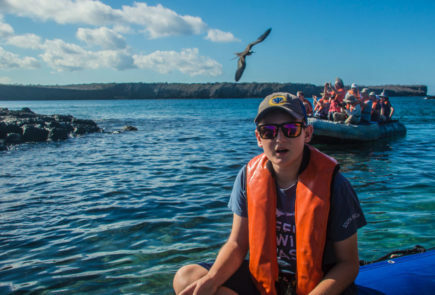 Fun Fact: Larger, multi-guided expedition vessels are the only way guests can have numerous options available when it comes to Galapagos activities. Find out why here. Regarded as one of the popular activities to partake in during an adventure vacation in Galapagos, kayaking is the best way of getting an up-close and personal look at the coast and what lies below. Grab a partner or head out solo aboard one of our kayaks and glide peacefully alongside the majestic, geological beauty of Galapagos as its equally majestic wildlife surrounding you from virtually every direction. Rays will slide by underneath you as sea lions sneak up to your peculiar vessel to get a closer look, all while enormous frigatebirds swoop in overhead and ogle you, too! Kayaking activities are available aboard each of our vessels and at our beachfront hotel. Safety instructions are provided prior to use, and older children are welcome to kayak in the company of an adult. Comfortable seating is a major feature of our kayaks, so as to facilitate more relaxed and longer journeys along the islands. Has the underwater life that swims along the surface of Galapagos waters tickled your fancy? Jump right in and greet them face-to-face by snorkeling in Galapagos! Our snorkeling activities allow guests to swim for extended periods while staying in close proximity of a beautiful white-tip reef shark, a lazy sea turtle or an elegant ray. Feeling extra playful? Brace yourself for the wild and curious energy of the sea lions that will bombard you with their curiosity and playful nature! Not to mention, you’ll be surrounded by a wide assortment of colorful fish that populate the waters! Afraid of snorkeling? Find out how one of our beloved co-workers managed to overcome her fear of snorkelling in Galapagos! Interested in exploring the underwater world of Galapagos even further? The Finch Bay Galapagos Hotel offers PADI-designed programmes in safe and fun scuba diving environments in Galapagos. Not a big fan of the water? Don’t worry, we’ve got you covered! You don’t have to get wet to experience an adventure vacation in Galapagos properly! Panga (inflatable dinghy) rides and our glass-bottom boat aboard our Galapagos Expedition Vessels provide guests with a dry and comfortable means of observing the coastal shores and underwater world. Our guides will be on deck to provide you with a running commentary on what you’re seeing, both around you and through the bottom of the boat as we glide along the coast. Explore the epic and surreal terrain of Galapagos with your Naturalist Guide and embrace the fact that you’re walking over a ridiculously fresh piece of Earth, surrounded by equally unique animals! You’ll venture across a beautiful “no man’s land” in the company of your guide, who will narrate as many of the sights and scenes of the Galapagos as possible. Hikes range from mid- to high-levels of difficulty. Strolls along the beach, on the other hand, are casual and require very little exertion. On these “leg-based” excursions, guests will be privy to the spectacular sights of wildlife and their extraordinary behavioral patterns and ways of life. Beaches in Galapagos, mind you, have been ranked as some of the most beautiful in the world! 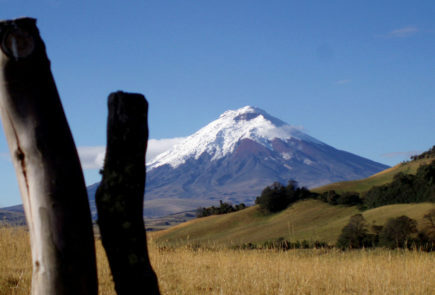 Explore the ruggedness and spectacular scenery of Galapagos on two wheels! This activity is available aboard our vessels and at the Finch Bay Galapagos Hotel, offering guests a natural way of exploring the islands (exclusive to Santa Cruz and San Cristobal islands). Our Galapagos Cruises offer five star cuisine, hot tubs, modern-style lounges, informative lectures, and much more! Our Finch Bay Galapagos Hotel offers five-star cuisine, a beachfront property, a swimming pool, poolside bar, the Finch Bay’s own Sea Lion Yacht, snorkelling, kayaking and even surfing activities. And did we mention it’s one of National Geographic’s Unique Lodges of the World? A Galapagos adventure vacation with Metropolitan Touring is a once-in-a-lifetime experience, offering each of our guests a journey that fosters reflectiveness via pleasant and one-of-a-kind explorations. So, are you ready to write this next chapter with us? Start looking into your Adventure Vacation in Galapagos today! With parents that worked for the U.S. Foreign Service up until he graduated from high school, Chris was raised to have the heart of a nomad throughout his life. He has resided in Honduras, Guatemala, Colombia, Panama and Ecuador throughout his years, and just recently spent the past four up in Canada finishing his Bachelor’s Degree in Philosophy & English at the University of British Columbia. 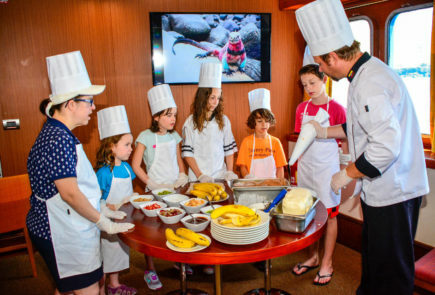 What kind of activities and entertainment services are available for kids on a Galapagos cruise?